I read Fragile in early 2009 when the title was first released. Reading the second book Broken of the series focusing on Luke’s twin brother Quinn Rafferty earlier this year when it was released in March had me wanting to re-read and re-visit the characters of Fragile, a story that had always left a deep impression on me since it is that good a story. 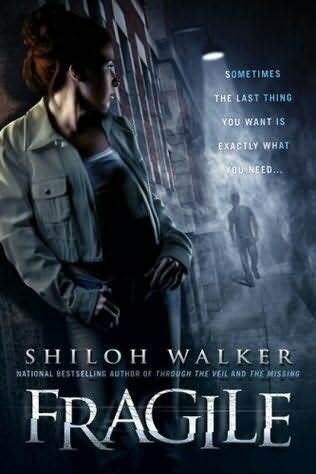 Fragile is the type of story that defines why Shiloh Walker is a favorite author of mine who definitely rates at the highest on my auto-buy list. My friends kept teasing me because I was in such agony when Broken was first advertised to be released and I guess anybody who has read Fragile would understand my fascination with Quinn Rafferty and I have no doubt many of those who have read Broken would agree with me that he is one sigh worthy hero. This does not mean that Luke Rafferty on his own is not sigh worthy himself. For me, I think I enjoyed Luke’s quiet intensity a bit more than Quinn who is a bit more darker and edgier than Luke, which is quite understandable based on the fact that whilst Luke and Quinn are twins, they were separated at birth when their mother who is a drug addict fled with Quinn just so she could punish their father. Their mother had gone underground not to be found no matter how much Luke’s father had tried to find them, and in the end, it was the inevitable death of their mother by drug overdose that brought Quinn back into Luke’s life. Luke had never known till then that he even had a twin and the first few pages of the book bleed raw emotion when these two first meet, a belligerent and abused Quinn with Luke who had got the better end of the deal when he ended up with his father. Years later, Luke and Quinn are both serving in the army in Afghanistan when a round of bullets rip through Luke’s leg ending his stint in the army. By then Luke had already tired of the continuous stream of violence that never seemed to end. So trading in his combat gear for hospital scrubs seems to fit Luke like a glove and it is there that he encounters Devon, a social worker who doesn’t come to the hospital with the best of patients. From the get go, Luke is fascinated with Devon and although she doesn’t seem like she knows that Luke even exists, Luke can’t help looking out for her while on duty. Devon though she doesn’t let it be known is warily interested in Luke. Sexually abused when she was young and being lost in a dark place for a long time until a social worker had pulled her out of it and helped her, Devon has her own hang ups surrounding her. To Luke Devon is as fragile as a piece of well spun glass and wants to protect her from all evil elements but Devon on her own is a force to be admired. Though Devon knows Luke is a complication that she best avoid, the intense awareness and attraction between the two doesn’t rest until they end up together. The best part of the story for me was the fact that Luke seems to take so much care with Devon and it just touches the right places in my heart to read through such a wonderful character. Though Devon and Luke’s relationship progresses and ultimately fall in love with one another, there are forces around them that create havoc on their relationship. Stalked and nearly bludgeoned to death doesn’t seem to be the end of the upheavals in store for Devon and Luke. Someone more sinister than the likes anyone could imagine continue stalking Devon until it eventually drives Luke and Devon apart. The pieces only fall in place at the very end and its a long and tough road for Luke and Devon until they find peace and happiness with one another. This story ends off begging for Quinn’s story to be told. And it is a testament to Ms. Walker’s ability that these two stories are so wonderful that it begs to be read from start to finish in one sitting. If you haven’t already read these two books, buy them, find yourself some quiet uninterrupted time and lose yourself in the two Rafferty’s that would individually charm and seduce you with the turn of each page.